More daylilies have started blooming here, and many of these are ones that I only bought last year which makes seeing them bloom this year in the garden rather exciting. It is nice to see them settled in and how the flowers look next to other flowers. One thing I have noticed this year is how the colors of a few of the daylilies are a little different this year than they were in previous years. Some of my old-fashioned red ones that I had in the last post are not as red as last year; they seem to be a little more brown-colored. 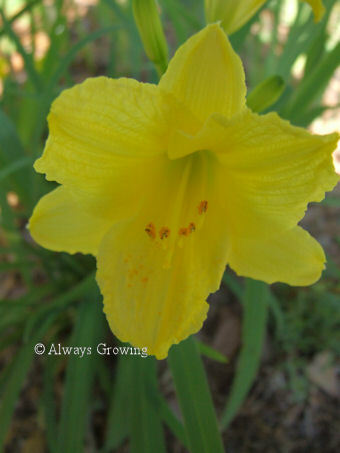 One daylily bloom that is strikingly different this year is Eye-yi-yi. The past two years it has bloomed orange, but this year it is more of a peach color. Strange, huh? 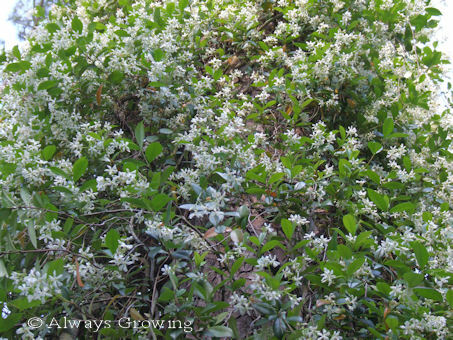 One that is blooming with a true color is Misty Mayhaw. 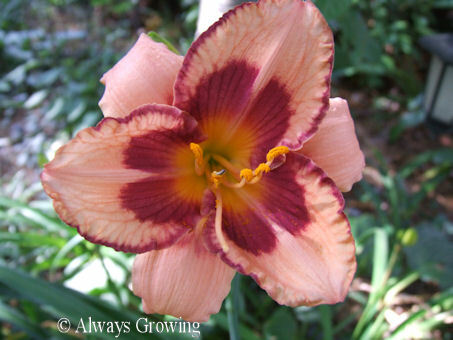 This daylily puts out many huge, thick petaled blooms on sturdy stems. 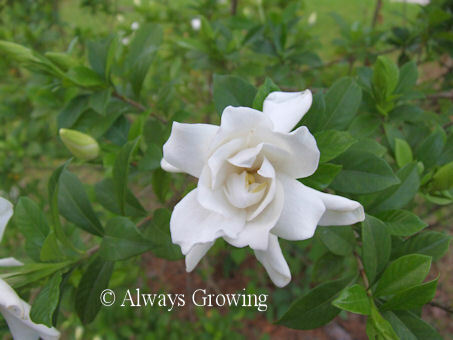 This is a vigorous repeat bloomer, too. 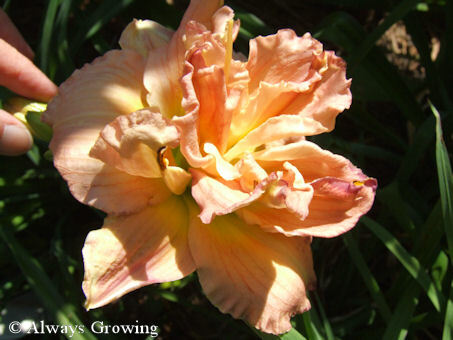 Today’s final daylily is an unknown one which is a gorgeous, frilly peach. This is one of the ones I purchased just last year, and, unfortunately, it did not have a tag. 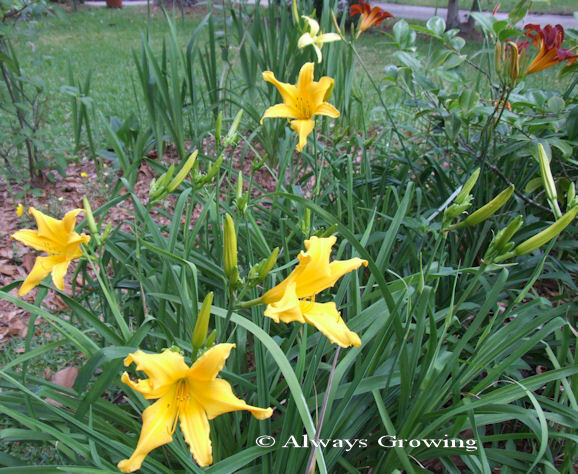 There are still more daylilies in the garden that will be blooming shortly. 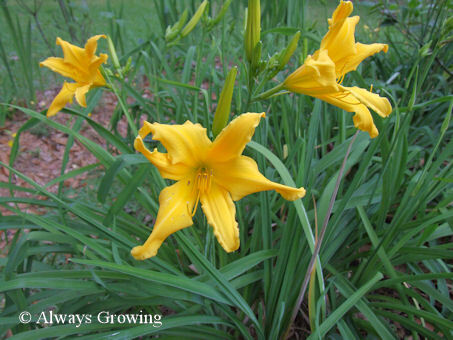 When I look around my garden at all the lovely daylilies, I am so glad I decided a few years ago to start putting in more blooming perennials. 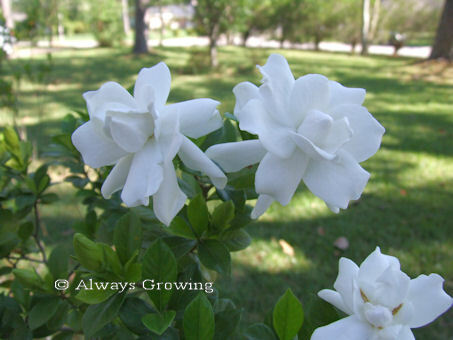 That was a decision I wish I would have made when I first started gardening. The warm weather has ushered in daylily season. 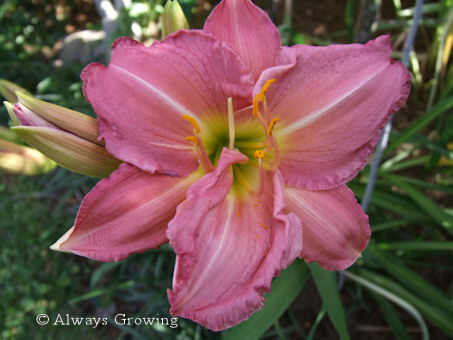 The first daylilies started blooming almost two weeks ago with the little reliable Stella d’ora being the absolute first to flower. Last year was the first year I needed to divide these, and now there is a nice line of these little gold flowers in the circle garden. 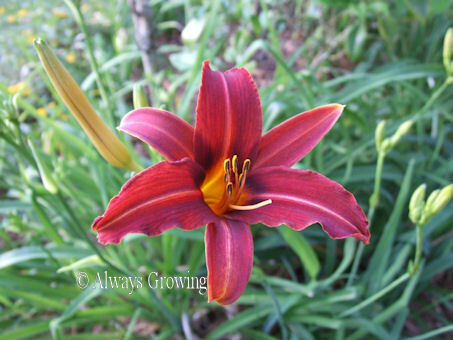 Next, to start blooming were the old-fashioned red daylilies. These are from my mother’s garden and were very popular in the ’60’s when she received them from one of her gardening friends. 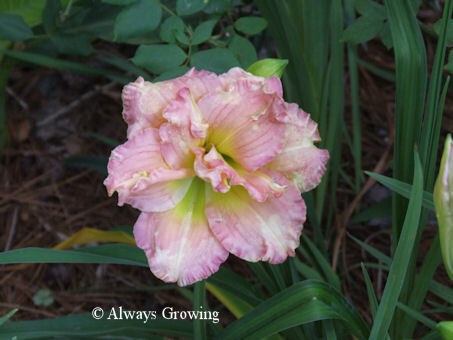 A ruffled pink daylily that I purchased just last year was the next to show up. It didn’t have a name tag, which is a shame because this is such a pretty flower. 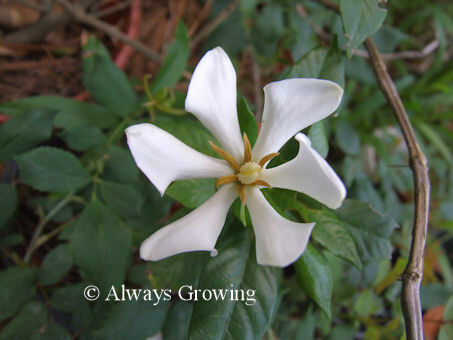 I know it must be a tetraploid because the stems are very sturdy and the flower petals are very thick. 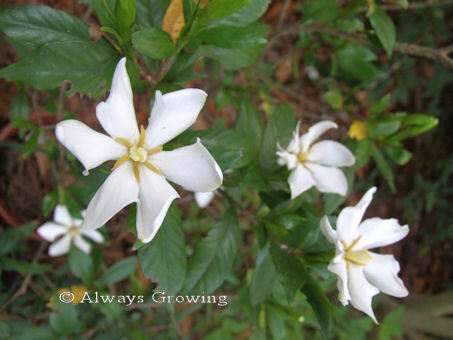 Happy Returns, a lemon yellow version of Stella d’ora, started blooming just about a week ago. I wish I had more of these. Unfortunately, they are not ready to be divided. 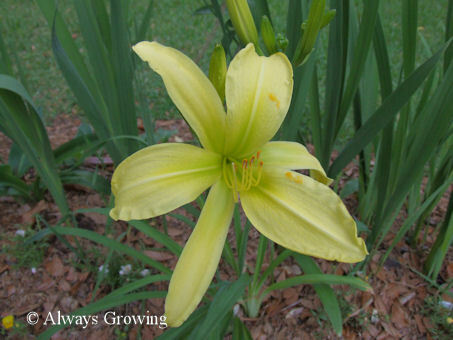 Next to Happy Returns, I planted a daylily with the same lemon-colored flower, but where Happy Returns makes a small flower, this one has a huge flower. This is the largest daylily flower I have ever seen. These flowers have to be about nine inches across. Lavender Girl, another one I bought just last year, has also started blooming. There are a lot of buds on this daylily which surprises me since it hasn’t been in the garden long. It must be very vigorous. 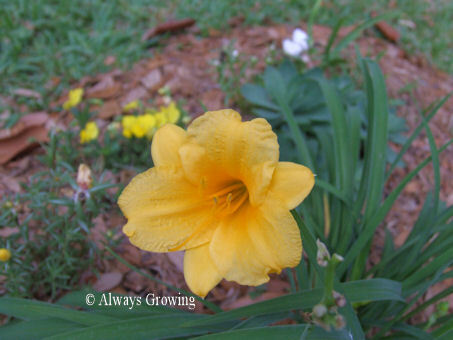 The last one to bloom so far, has been a yellow daylily which my mother gave me years ago. She got this one about the same time as the red one pictured above. I have added many more daylilies to the garden in the last year, so there are still more to bloom. 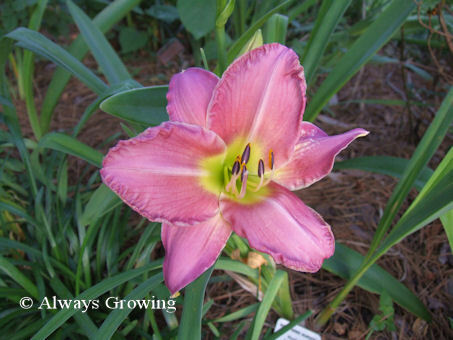 Most have buds in various stages of development, and a few have none yet (I am sure they are late blooming daylilies.) So, it looks like daylily season will be a nice long one this year.